That probably reads like a click bait headline. Oh well. I'm keeping it. I like it. And I completely one hundred percent believe what I'm about to tell you IS the most important thing a writer must learn to do. I wonder, right now, what do you *think* it is? Write every day, even when you don't want to? No way. I don't believe that. Develop a thick skin? Not this either, although of course this is true, but you've heard it a million times. Write a FANTASTIC story in order to get it published? Nope. Because I'm not even talking about writing to get published. I'm talking about writing wherever you are on the path of being a writer. Maybe you're just playing around right now. Writing to see how it feels. See what it looks like for you. Or maybe you are one that's been doing this for a while, and you're thinking about querying agents soon. Maybe you're like me and you've published some books, had some successes and some failures, and you're wondering - what's next? There's one thing you have to do and keep doing no matter if you've never published a book or published a hundred books. You have to learn to write with doubt. I feel like I could make a rhyme about that. all writers learn to write with doubt. 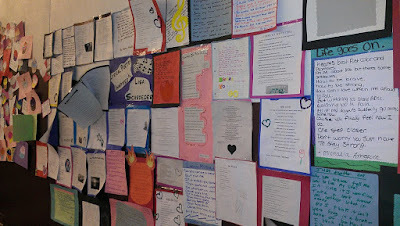 I did an author visit at a middle school one time and I LOVED this wall of poetry they made in honor of my visit. Do you think those students worried about me reading the poem they had written and that would be hanging on the wall in the room where I'd be speaking? Of course. Do you think any of them were afraid I might not like what they'd written? Absolutely. But you know what? They somehow managed to DO IT ANYWAY. Every time I start a new book, I have doubts. I am scared. I am worried it won't be good enough. But I understand it is part of being a writer. It shows I care about the work I'm doing, and that's not a bad thing. The difficulty is in learning how to manage the fear. In her book BIG MAGIC, Liz Gilbert tells us to tell Fear it is welcome to come along with us, but it does not get to drive the car. No, if it wants to come along, it has to sit in the backseat and be quiet. I think I've always thought of Doubt as this pesky little thing on my shoulder that won't go away. It really likes my shoulder, and so it sits there. And when it starts whispering ugly things in my ear, I have a choice as to whether I listen or not. It's completely up to me. I have the power - Doubt does NOT have the power. It simply has messages, messages that often times aren't even true. Often, Doubt is loudest when I sit down to start my work for the day. Opening the document is often the hardest part, yes? But once you just do it, and you let your characters talk to you, Doubt tends to quiet down. I get so many notes and emails from kids and teens asking me - how do I write when I'm scared? Scared it won't be good enough? Scared I don't know what I'm doing? Scared people will say bad things if I even manage to somehow show it to someone? I wish I could say there is a magic trick writers use to make the fear and doubt go away, but there isn't. The truth is, every writer who has finished a book managed to figure out how to send it to the back seat or to write with it sitting on their shoulder. You can't avoid it. You simply have to figure out for yourself how to write with it. Happy March - hope you have a great month! Great post, Lisa!! I'm going to bookmark this so I can read it whenever I need encouragement. Awesome, I love this Lisa. Thank you for sharing this.